Singapore, 25 March 2010 — Singapore Telecommunications Limited (SingTel) today announced that it will introduce the first BlackBerry service plans for youths in Singapore called BlackBerry® Flexi Youth and BlackBerry Flexi Value Youth Plans, The new plans, available from 26 March cater specially to students and Full-time National Servicemen (NSFs). The plans are ideal for youths who want to be connected while on the go. The comprehensive BlackBerry service plans offer free incoming calls, up to 200 minutes of outgoing talktime and 15GB of data. In addition, BlackBerry Flexi Youth Plans come with free unlimited SMS and free outgoing calls from 37 tertiary institutions and 11 army camps. Students and NSFs can now enjoy instant access to their emails, online messaging, and internet surfing on the go. 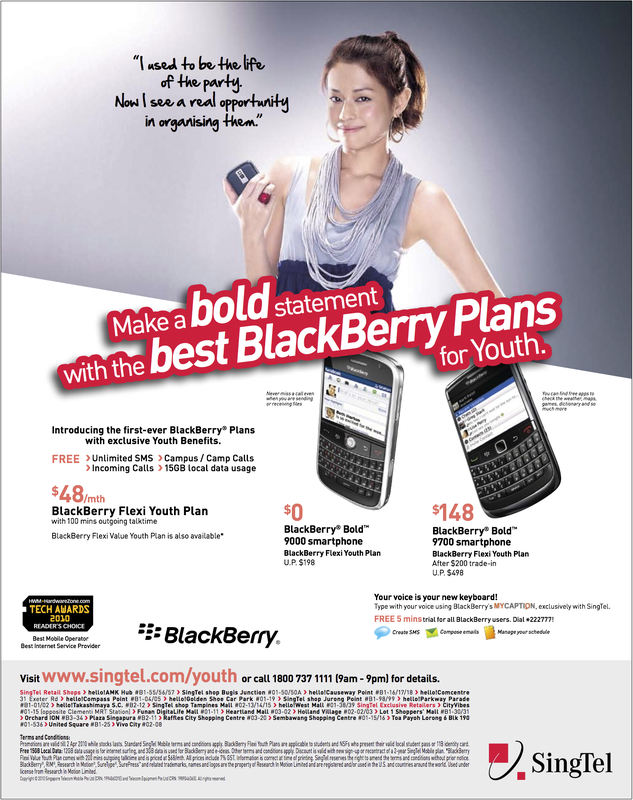 BlackBerry Flexi Youth and Flexi Value Youth plans are priced at S$48.00 and S$68.00 a month* respectively, and are the most affordable BlackBerry service plans for youths. This page is generated on 21st April 2019, 04:27:04 (UTC) in 0.207s with 24 queries using 4.0 MiB of memory.